Board meetings are held monthly on the first Tuesday at 7pm and are open to all club members. Please contact the President or Secretary in advance if you would like to attend a Board meeting. Member meetings generally include an education program and are usually held on the third Tuesday of odd-number months in the greater Acton/Boxborough area. Visitors are welcome to attend these free programs. Light refreshments are available. There is a brief business meeting at 7pm, followed by the program. April 1 Dr. Ariane Goerlich DVM, Emergency and Critical Care, Blue Pearl Specialty & Emergency Pet Hospital, will present "What Constitutes a Medical Emergency" & "Top 10 Reasons to Visit an Emergency Facility". She will discuss what you can do for home treatment and identify when its necessary to seek veterinary attention. This is a FREE event, but space is limited so you must register in advance. Dr. Janna Guerrette, Chelmsford Animal Hospital: What is a Medical Emergency? March Joy Viola: The Golden Retriever: A Scottish Legacy. May Paint a Picture of Your Golden! November Let's Learn About Tracking! 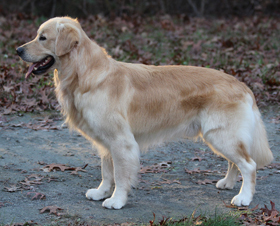 November Berna Hart Welch: "Using the Breed Standard to Evaluate the Golden Retriever"